Last summer as we were returning home from a two day visit to Branson, Missouri, my now 15 year old grandson (Colby) talked about how much he enjoyed everything ... and wished we could have stayed longer. Well, shortly before the end of his first year of high school, he enthusiastically said yes about returning to Branson this summer for a longer stay ... so “he could experience“ Silver Dollar City and other shows including magic ones along with enjoying the high energy talented Haygoods and the awesome singer, Cassandre' again ... and to see what else there was to do in Branson. We started the entertainment part of the visit with the Hamner Barber show ... 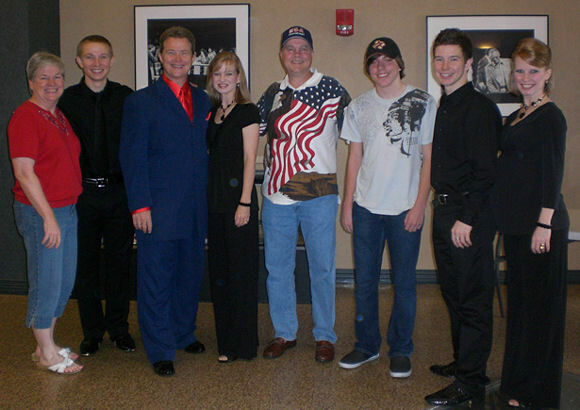 It is total entertainment from start to finish with the hilariously, talented Jim Barber, one of the world's great ventriloquists, and renowned magician Dave Hamner with his wife Denise. 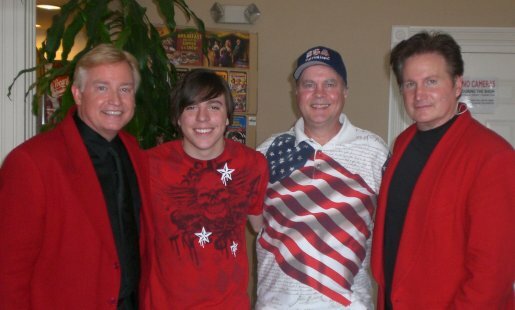 And Jim and Dave surprised us too with their good signing voices when they ended their show performing a patriotic song saluting the troops with a final very moving magic act. Every age group from little ones to grandparents will love this show! While this country variety show stars the outstanding Clay Cooper who impersonates some of the country music great ones and sings several of his own ... there are great dancers including Clay's wife, an amazing roper (from America's Got Talent), and other singers including Clay's son (7) along with comedy bits. This show should be on "the must experience list" for all who like country music and things related ... And children will like it too. Yes, I am a country music fan! Elvis Presley remains my wife, Mary, and my favorite all-time signer and Colby likes him too. So, all three of us sat in amazement as Tony Roi performed as Elvis ... and Roi has it all down perfectly... the voice, looks, moves, and mannerisms. And the impression he made on my wife remains ... as her eyes still light up when she talks about his show with other women. Enough said! 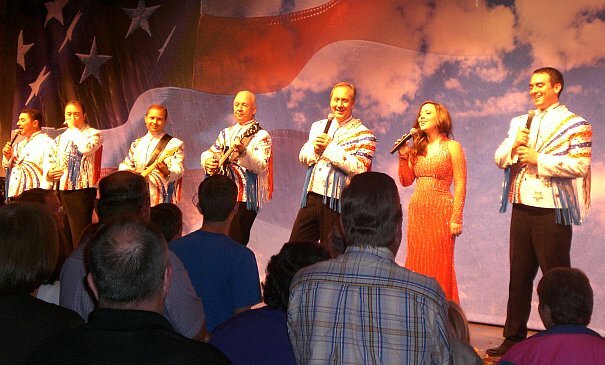 We did see both great shows again and still consider them two of the best ones in Branson. (Both shows have moving patriotic performances.) Colby also got to meet Aaron Haygood (17) and share some words. Cassandre' even remembered Colby from last summer during her show and sang to him. We have a photo to prove it. She also took another picture with him after the show. 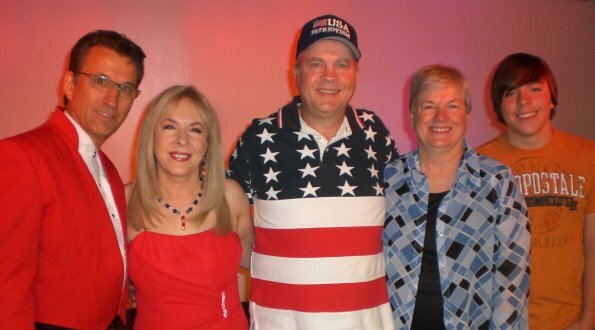 Mary and I met Barbara Fairchild and her husband, Roy Morris, during Branson Veterans Week last year and really enjoy their performing country songs and interaction with each other. Barbara is one of country music's all time great women singers and her naturally funny personality with Roy's husband comments is very entertaining. And Barbara loves to interact with the audience ... She did so with Colby and me with Roy doing the same with Mary. 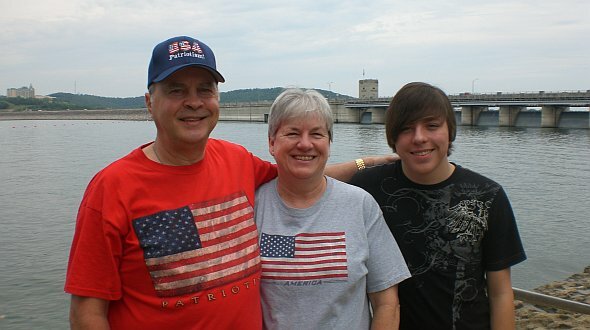 Barbara and Roy are also very patriotic and tirelessly involved with Branson Veterans Week events each year. Another entertaining "must see" show is the talented Rankin Brothers (Mark and Matt) and their amazing back-up singers, the Rankinettes ... taking the audience on an enjoyable performance of classic music hits of the last five decades ... impersonating the respective super stars. And they deliver each time with an engaging personality to match! 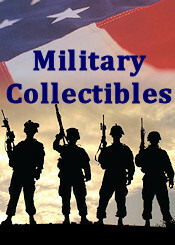 Moreover, the tribute to the troops with the signing of "Unchained Melody" and an associated video is very moving ... 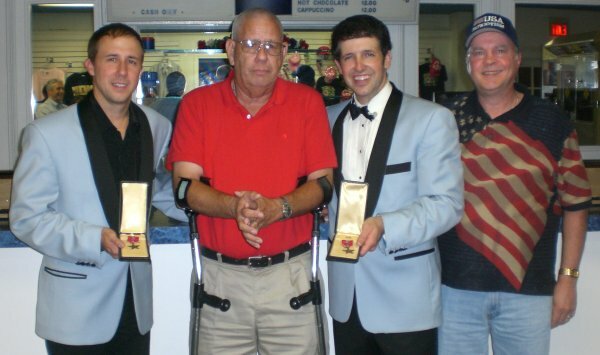 In fact, a disabled Vietnam War hero was so moved by this "Unchained Melody" tribute along with Mark and Matt Rankin proudly wearing their patriotism on stage ... that he presented each with one of his Bronze Star medals. This hero, who was wounded multiple times and received the Silver Star during his duty in harm's way, requested his name be withheld ... in honor of his best friend who made the ultimate sacrifice while serving with him in Vietnam. He felt his friend deserved a medal too. After the veteran and his wife left, we spent about an hour in enjoyable conversation with Mark, Matt, and Larry Rankin (their dad). I am proud to call them friends too. We were very happy that our scheduled allowed us to see Tom, Andrea, Briahna, Brydon, and Garon Brett perform a variety of songs including solos and an athletic display by Brydon (25) and Garon (20) with basketballs. And Colby and I had a real treat when Brydon brought Mary on stage and sang to her. 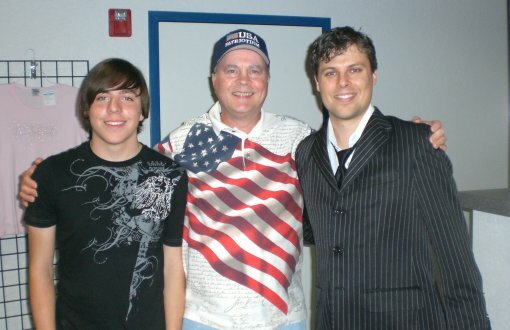 Thankfully, a change in plans on our last day in Branson allowed us to see these two talented brothers, Rhett and Ross, who include several great songs from musical movies and Broadway shows along with a touching patriotic song in honor of the troops. 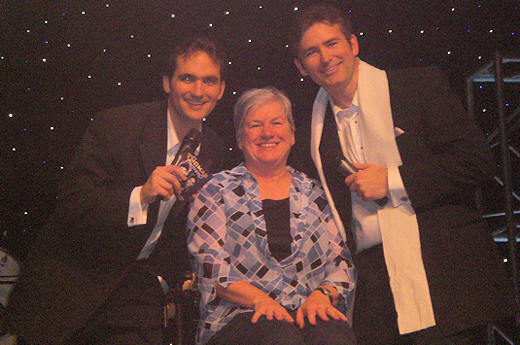 Mary was also brought up on stage where Rhett and Ross Thomas had a very funny exchange with her including with a roll of toilet paper. Colby took many pictures of her too as we both laughed knowing how much she would like to be elsewhere. Mary was still lucky, as she didn't have to be a human dummy wearing a bright yellow mop hair wig for a ventriloquist ... like I did during the "memorable" Dalena Ditto show when attending Veterans Week in 2009. Yeah, I volunteered too ... after the talented ventriloquist looked right at me! Then there was the day we spent at Silver Dollar City where there are many fun things to do including thrill rides with many water ones and live shows with the streets shaded by a canopy of trees. We really enjoyed the Choctaw Charlie's Frontier Follies with the beautiful Silver Dollar City Saloon Girls and the rest of the shows talented cast including the comedian. The magician Peter Gossamer, who is in his last year with Silver Dollar City, was another great time at the theme park. On a special note ... I was privileged to participate in the dedication of the Avenue of Freedom by the Branson Veterans Task Force (BVTF) on July 5th, which included a proclamation by Mayor Presley. The Avenue of Freedom honors veterans from past wars, present wars, heroes who gave their lives for freedom, and those who died in the attacks on September 11, 2001. 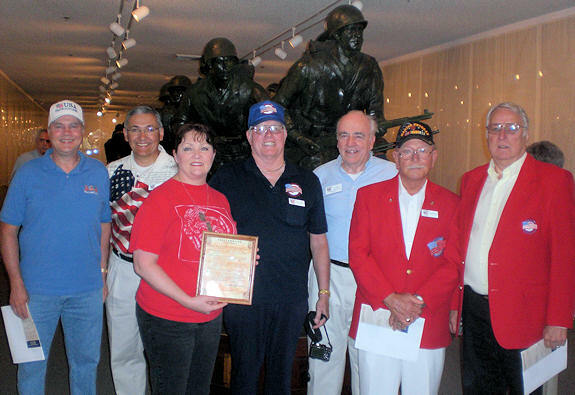 I also visited with members of the BVTF at the Veterans Memorial Museum concerning the BVTF's association with the Spirit of 45. Yes, it was a very full week of enjoyment ... experiencing more of the Branson area including a drive to the Table Rock Lake Dam and the surrounding area. Yet, there is still so much more to enjoy in the Branson area, which we will do on the next visit ... including more outdoor activities starting with Table Rock Lake ... and the rained ruined plans for horseback riding and "doing" the zipline. Branson is definitely for everyone no matter your age! 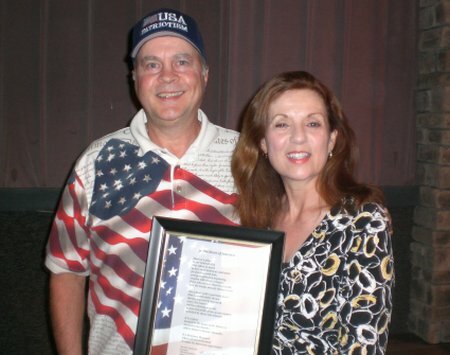 Author's note... Read my other articles... Entertainment, Fun, and Patriotism in Branson, Branson Veterans Week - 100% Patriotism, and Great Time Again During Branson Veterans Week ... My poem, In The Heart Of America, is about Branson.